Last week, I got my first chance to try the Hemel Hydroendurance. 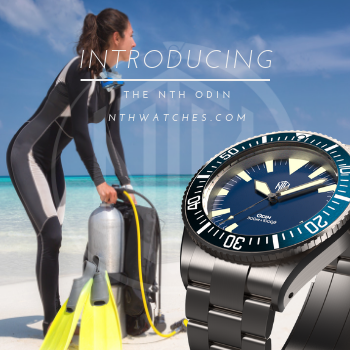 Released last summer, this 300m tool watch is Hemel’s first diver and has proven to be a roaring success. Hemel has all but sold out of the first production run and has another batch on the way. They sent me a blue dial loaner for this review. This particular watch has seen regular use and shows a desk diving mark or two. The HD’s stainless steel case is brushed to almost a matte finish. It is 42mm wide and 46mm long, and just 12mm thick, including the dome. 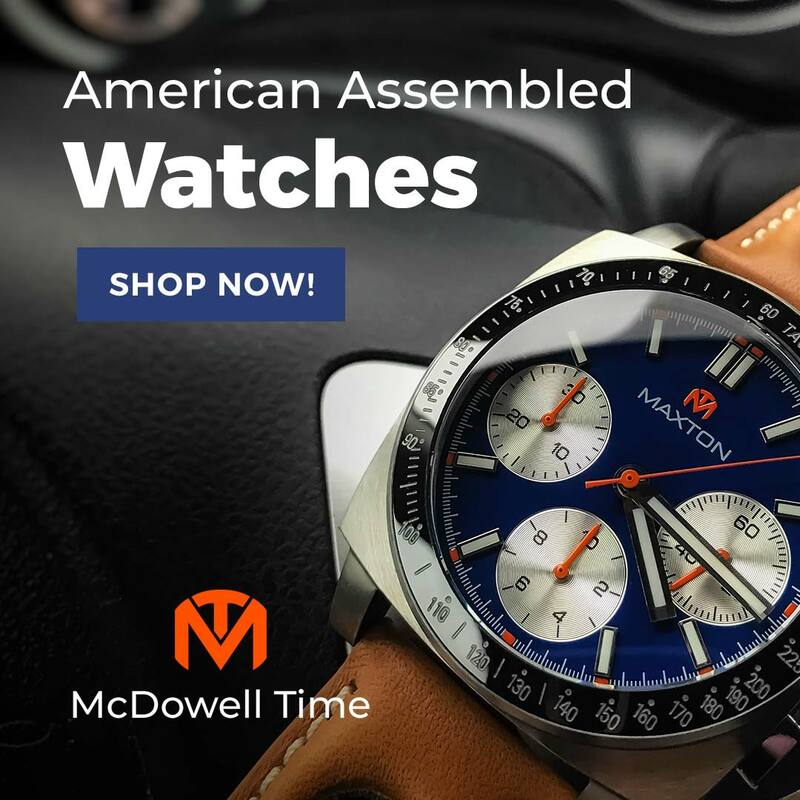 These measurements give it a healthy wrist presence while steering well clear of the brick-like proportions flaunted by some, more showy, diving watches. That said, the Hemel is undoubtedly a sporting piece. Perhaps the biggest clue is the oversized crown. Most brands equip their divers with tall crowns, ostensibly to facilitate setting while wearing wetsuit gloves. (Honest question, why wouldn’t you set your watch before you put your glove on? I don’t dive, so I freely admit my ignorance, but this has never made sense to me.) Hemel resisted the urge to make it tall and went wide instead. Flanked by a pair of angular guards, the knurled and signed screw-down crown is still easy to grip, but does not risk poking your hand when you bend your wrist. In my opinion, crowns that keep close to the barrel are also more attractive. The case back bears a Hemel designed coat of arms complete with Renaissance-era dolphins. It is quite ornate and stamped in high relief. Behind it lies a Miyota 9039 movement. Like others in the 9000 family, this 24-jewel automatic hacks, hand winds, and beats at a silky 28.8k. The difference is that it lacks a date wheel, so it does not have a non-functional first position when you pull out the crown, and you will never feel the phantom click of a hidden date wheel turning over. I’ve never considered these to be vexing issues on no-date watches, but I know they drive many enthusiasts absolutely crazy. Regardless of your feelings on the matter, you have to respect Hemel‘s attention to detail. 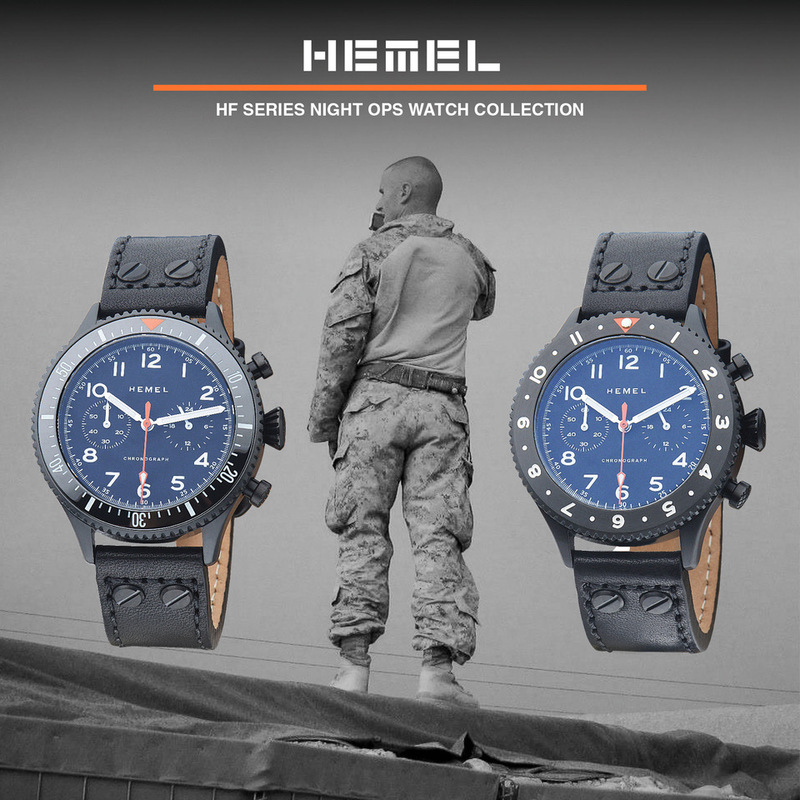 Hemel offers the HD series in blue, black, green, red, and orange; the color appearing on both the sandwich dial and domed sapphire bezel. The blue dial can shift to a deep royal in sunlight but usually presents as an inky navy that matches the insert. The 120-click bezel operates smoothly with no undue effort, and its index is fully lumed, just the way I like it. The handset is diamond cut and lumed; segmented pencil hand for minutes, a fat dagger for hours, and a spear-tip for the seconds. The cut-away markers are a combination of bars and darts topped by an oversized 12. The minute index is a series of perforations at the perimeter. It is a bold layout in daylight but simply outstanding at night when the C3 SuperLuminova struts its stuff; green, clean, and dazzlingly bright. Orange is a key element in Hemel’s brand identity. 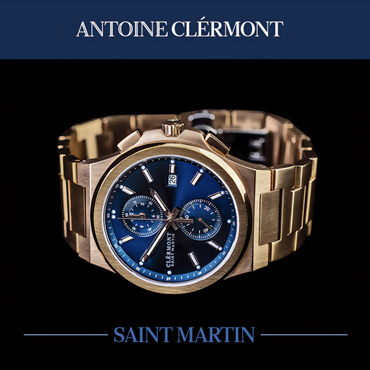 It is incorporated into every one of the brand’s watches as a nod to the founder’s Dutch roots. Here, it appears on the HD’s hour hand and in the anti-reflective coating on the sapphire crystal. That second one was new to me, and I have to say, it is the only thing I disliked about the watch. AR coating is one of those things that works best when you don’t notice it. Whenever the light caught the crystal just right and revealed that orange sheen, I felt like it was announcing itself in a way that the more common blue tinted AR does not. My son, on the other hand, who is generally agnostic about my parade of new watches, thought it was the coolest thing he had ever seen, particularly noting the way it played off of the blue bezel. To each their own. Personally, I think it might have bothered me less on a red or orange dial. A steel H-link bracelet with a signed push-button deployant clasp is standard. All links are solid (as are the ends) and secured with split pins. I really appreciated the way the clasp seamlessly integrated into the bracelet for a smooth, low profile appearance. Of course, there are no micro adjustments on this type of arrangement, but the links are small enough that I was able to find a comfortable fit for my 6.75” wrist.